Seamless gutters are state of the art, no leak gutters. The reason having leak-proof gutters is so pertinent to your home is because it prevents excessive water infiltration around your foundation or in your basement. Aluminum has become a popular choice because they are low cost gutters, as a result of using post-consumer and recycled material. But, aluminum gutters have pros and cons. The Advantages of aluminum gutters are; they come in a variety of finishes and colors, they are relatively low cost, resist corrosion, and can last up to 15 years if not damaged. Disadvantages of aluminum gutters is that they expand twice as much in the cold compared to steel or copper, and they do not hold up as well to storm damage. Why Choose Aluminum Seamless Gutters? Not only are seamless gutters practical and reliable, but they are also aesthetically pleasing. Designer gutters are custom cut-on-site for the exact fit. Also, at Minnesota Leafless Gutters we have more than 115 colors to match your siding, soffit, and fascia perfectly. 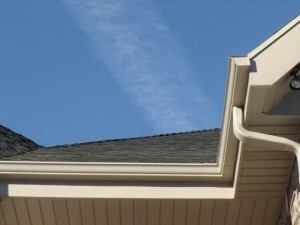 Furthermore, we offer two main gutter styles, the half-round and K-style Seamless gutters. The half-round are more common in older construction but since the 1960’s K-style are more common. Both have advantages and disadvantages. Luckily though, as a result of newer fabrication technology, both are affordable for your personal choice. Half round gutters were the most common until the introduction of the k-style in the 1970’s. These gutters have clean simple lines, which make it a pleasant compliment to textured roofing, which makes them popular among historic and high-end custom homes. Installation of half-round gutter systems is growing in popularity due to affordable materials and have one advantage over k-style gutters. As a result of them being round, all water drains completely out unlike the k-style. This is beneficial in Minnesota since it helps prevent breeding of mosquitoes. K-style gutters came into popularity during the 1960’s during the boom of industrial metal fabrication and seamless gutter technology. K-styles are used on approximately 80% of homes today. They are designed to have a crown molding, giving the appearance of a framed look around the roof and exterior walls. As a result of their style they are able to carry larger volumes of water compared to half-round gutters, and are also more durable. One disadvantage of this style is that these gutters are harder to clean, and the corners catch debris. Minnesota Leafless Gutters specializes in gutters and downspouts made from resilient materials which are ideal for the extreme seasonal changes in Minnesota. We use the heaviest gauge metal in the industry, for both residential and commercial. We use many materials and styles to fit your needs, and we can provide you with the aluminum gutter customized to your liking.